Good service is a tradition of the Schaeffler Group – in the same way as the development and production of high precision parts to premium quality. In order to ensure that our products perform reliably, we offer you the necessary support as readly as the development phase. With the new BEARINX-online module "Easy Ballscrew", you can easily calculate the rating life, mounting setting values for bearing preload and the spindle tensioning of screw drive bearing arrangements. And you can generate the calculation results as a PDF file for your documentation. The self-explanatory menu system will guide you through the inputs for the model structure, bearing selection and load case data. The preconfigured shaft systems, comprising locating/non-locating bearing arrangements or locating/locating bearing arrangements with spindle tensioning, can be modified to match the specific application. 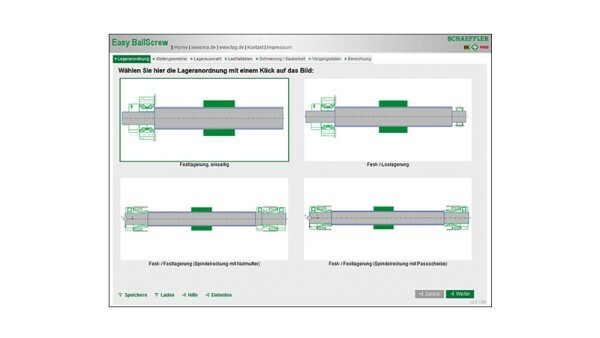 The geometrical and calculation data for INA and FAG rolling bearings are loaded from an integrated database. The forces in the drive system, due to the position, speed and x-direction force of the screw drive nut, as well as additional forces (due, for example, to a belt drive) can be incorporated in a duty cycle. The inputs include data on the lubricant. 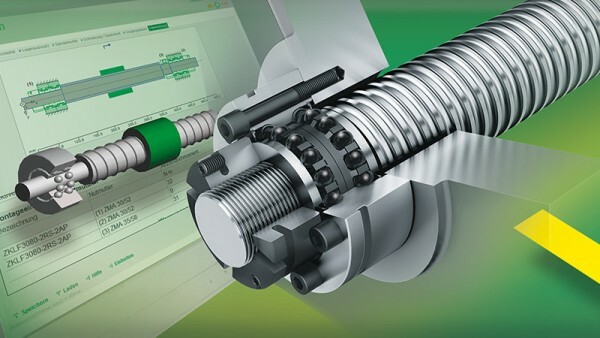 The calculation program "Easy Ballscrew" is available online only and can be used free of charge without restriction. After your initial registration and a positive verification you can start your calculation.